FC Barcelona struck first in its best-of-five playoffs series by downing Galatasaray Liv Hospital Istanbul 88-61 in Game 1 at home on Tuesday. 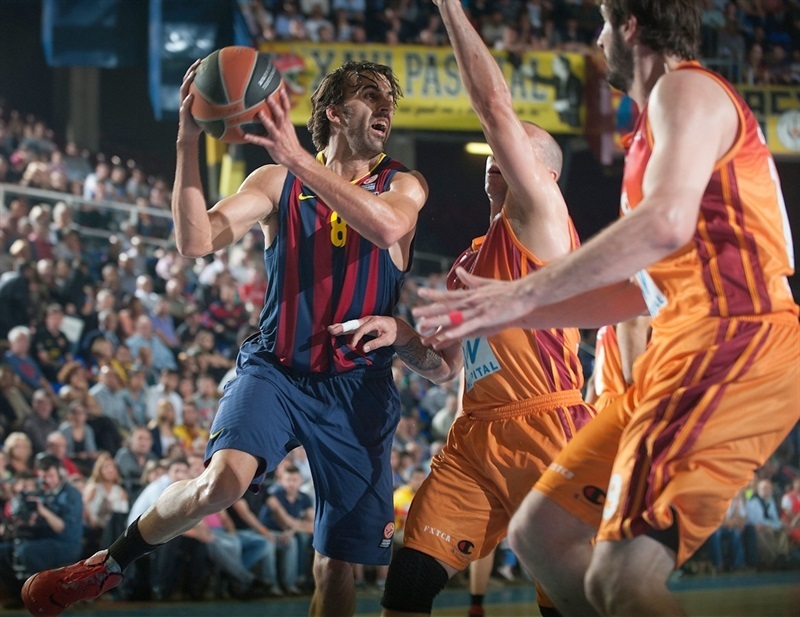 Barcelona has a 1-0 lead in the series, which will resume with Game 2 also at Palau Blaugrana on Thursday. 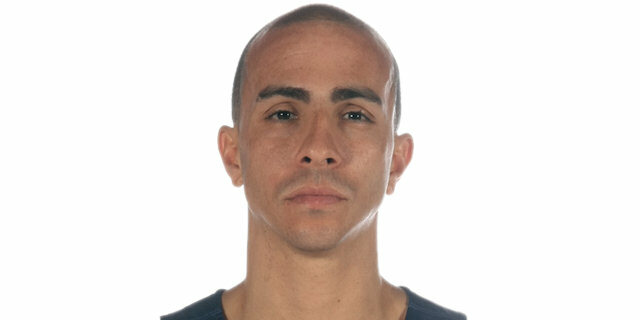 Barcelona was behind throughout the first half, but got its first lead shortly after Galatasaray star Carlos Arroyo left the game injured right before halftime. In the second half, the hosts surged behind the three-point shooting of Jacob Pullen, Bostjan Nachbar and Brad Oleson to win easily. 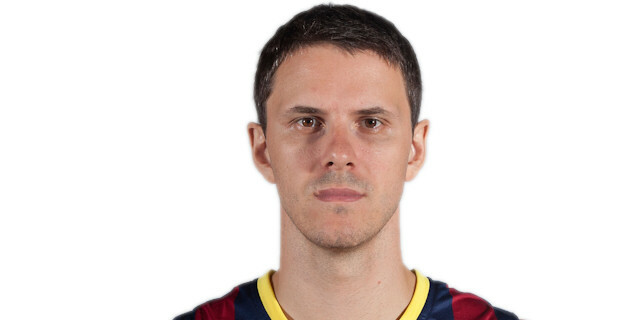 Nachbar led Barcelona with 19 points. He was followed by four more double-digit scorers: Juan Carlos Navarro with 12 points, Pullen and Olseon with 11 each, and Ante Tomic with 10. 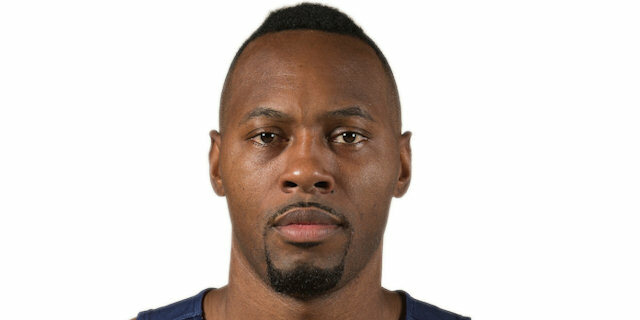 Joey Dorsey was the key to Barcelona's defensive turnaround, with 8 points, 11 rebounds, 2 blocks and a steal. 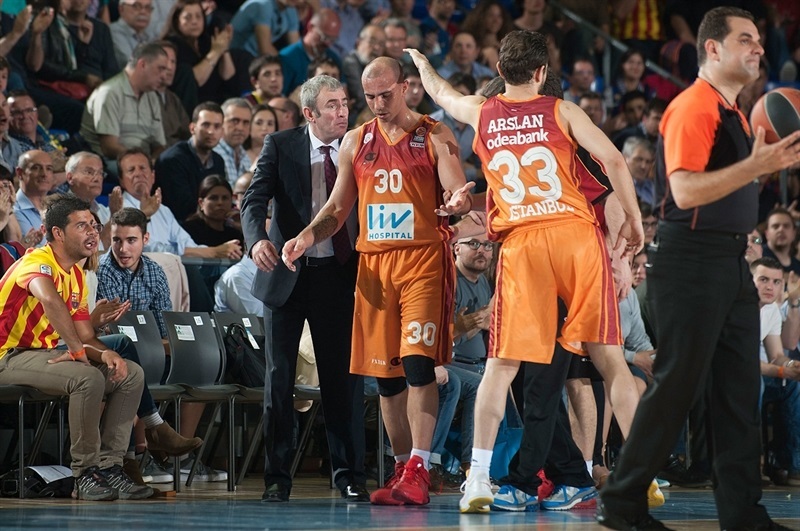 Arroyo had 14 points before his injury and still ended as Galatasaray's sole double digit scorer. Furkan Aldemir and Ender Arslan added 9 each. Arroyo and Aldemir had fueled a 0-9 opening run and combined for 17 first-quarter points to give Galatasaray a 14-21 margin after 10 minutes. Evan after Pullen gave Barcelona its first lead, 33-32, on back-to-back triples, Arslan hit his own to keep the guests up 33-35 at halftime. 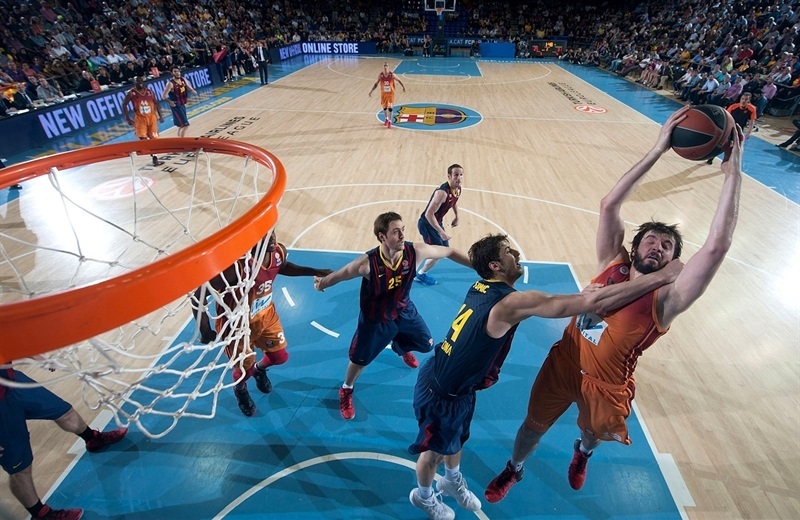 Nachbar and Oleson took it from there as a 14-0 run highlighted Barcelona's 55-26 second-half run to an easy win. Arroyo will undergo an MRI in Barcelona to determine whether he can play Game 2 on Thursday. Aldemir got Galatasaray going with a three-point play on a no-look pass by Arroyo. A jumper by Arroyo and a basket in close from Hairston soon gave the guests a 0-7 lead. 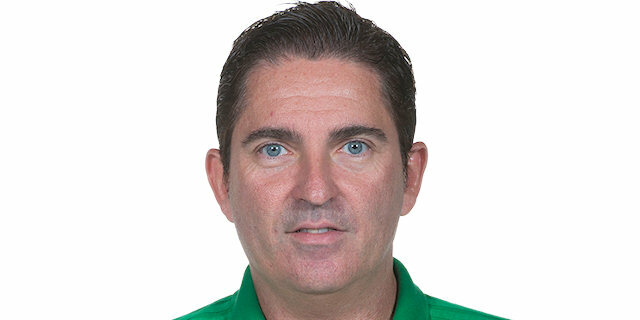 A dunk by Aldemir made it 0-9 as Barcelona head coach Xavi Pascual called timeout, out of which Navarro's three-pointer gave the home team its first points after 2 minutes, 21 seconds. Arroyo answered within seconds from downtown, however and when Erazem Lorbek and Hairston exchanged baskets, Galatasaray led 5-14 still without a missed shot. Tomic got his first basket before and Navarro swished from the same spot on the arc as before to cut the difference to 10-14. 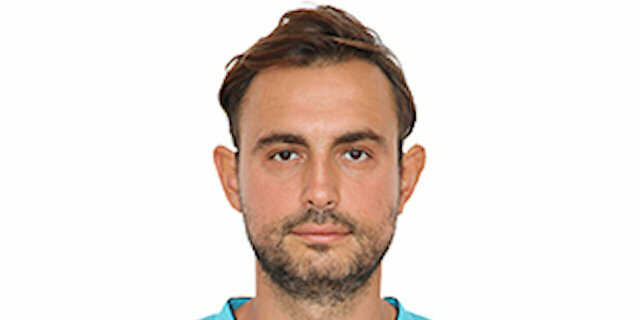 Arroyo again responded, with a stop-and-pop triple, before Tomic fed Victor Sada for a layup and Aldemir restored a 12-19 Galatasaray edge. Navarro shined with an acrobatic reverse but an unstoppable Aldemir scored in penetration for a 14-21 Galatasaray margin after 10 minutes. 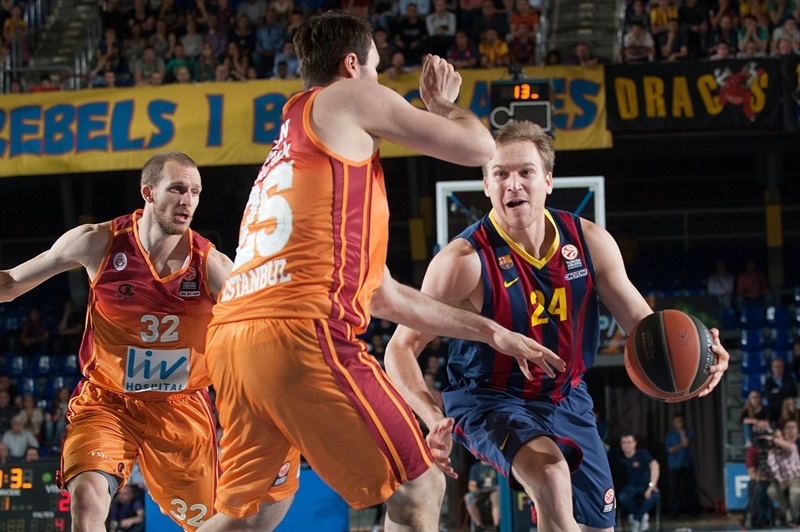 Milan Macvan made free throws early in the second quarter, while Barcelona sent in Oleson, Alex Abrines and Nachbar to try to open the floor. Nachbar nailed a catch-and-shoot triple, as Galatasaray started to miss open shots and opted to use twin point guards, Arroyo and Ender Arslan, together. 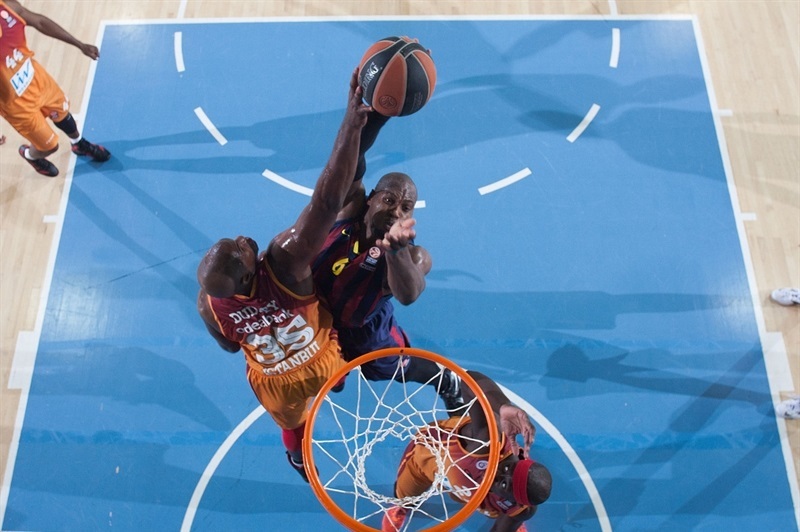 A put-back layup by Joey Dorsey brought Barcelona within 18-23. Nachbar banked in a one-handed floater and Arroyo hit a jumper from the right elbow, but Abrines bettered it with a triple. Erwin Dudley, in his first minute on court since a November injury, scored around the basket. 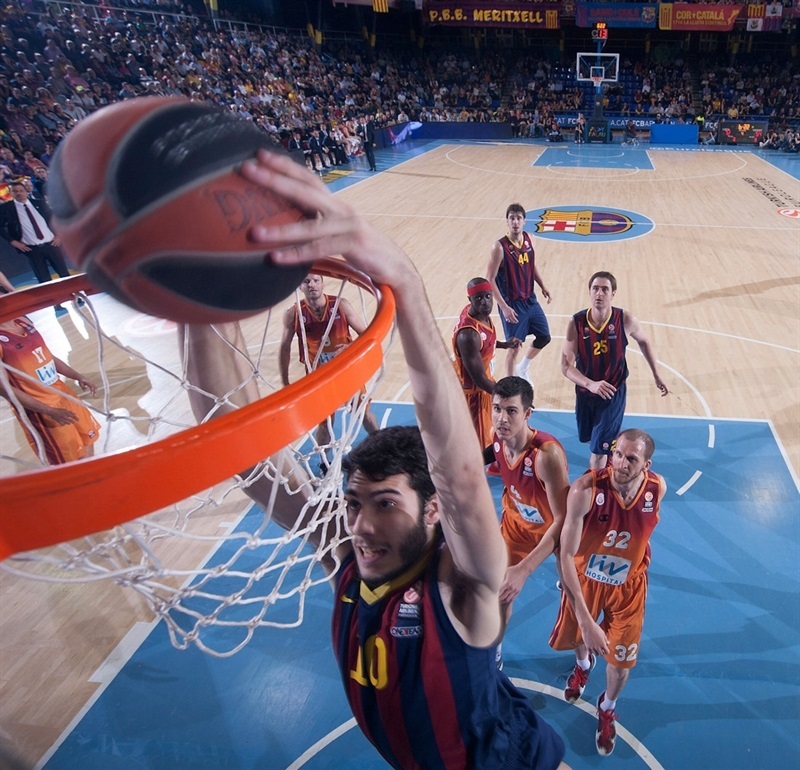 Marcelinho Huertas found Tomic for a layup before an off-balance jumper by Arroyo gave Galatasaray fresh air at 25-29. Arroyo kept pacing the guests with free throws but Pullen found Dorsey for a huge alley-oop slam and struck from downtown to pull Barcelona within 30-31. Bad news hit the guests in the last minute of the quarter, when Arroyo hurt his ankle landing on a miss and had to leave the court. But even when Pullen gave Barcelona its first lead at 33-32 with another triple, Arslan was able to finish the half with his own to keep Galatasaray ahead, 33-35, at the break. 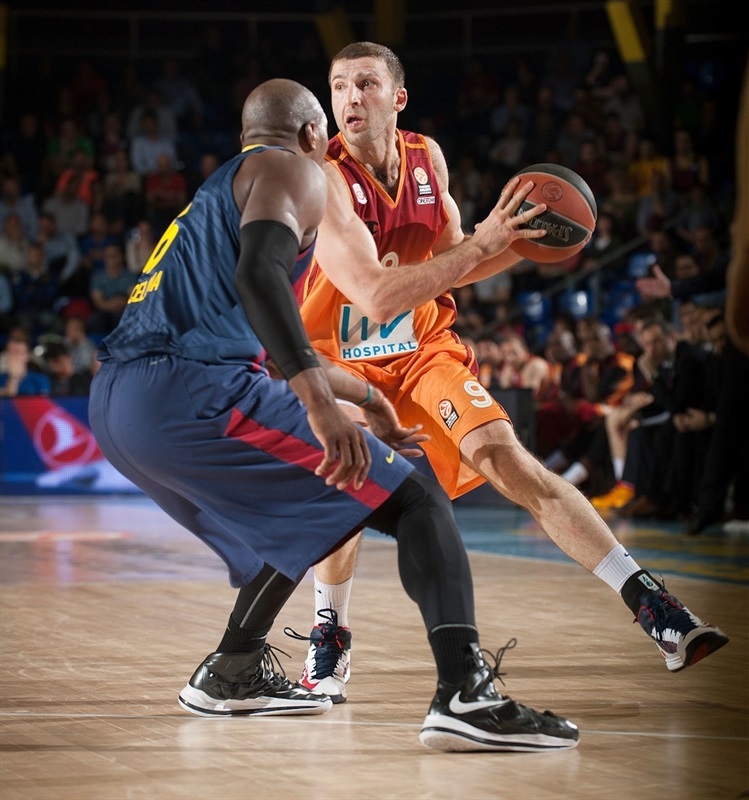 Pullen buried his third three-pointer in as many attempts right after the break to give Barcelona the lead again, 36-35. Hairston hit a close jumper but Dorsey followed a layup by putting back his own free throw rebound with a one-handed slam to ignite the crowd. When Navarro added a technical free throw on the same possession, the hosts were up 41-37. Zoran Erceg struck from the arc for his first points of the night, but Navarro's next 2 free throws and Lorbek's turnaround jumper made it 45-39. 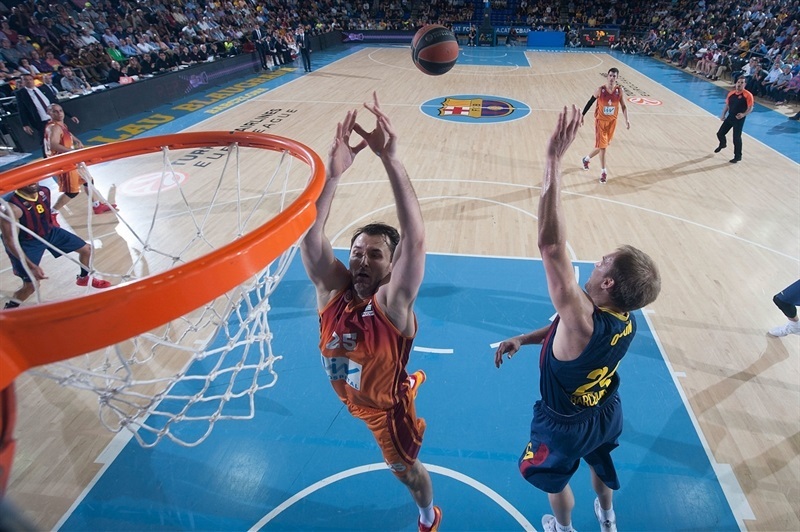 Galatasaray kept struggling to score, as Barcelona's defense excelled behind Dorsey's intimidation in the paint. Pullen banked in a five-meter shot before Dudley scored around the basket and free throws by Nachbar boosted Barcelona's margin to 49-41. Arslan responded with a driving layup but Nachbar did better with a three-pointer. 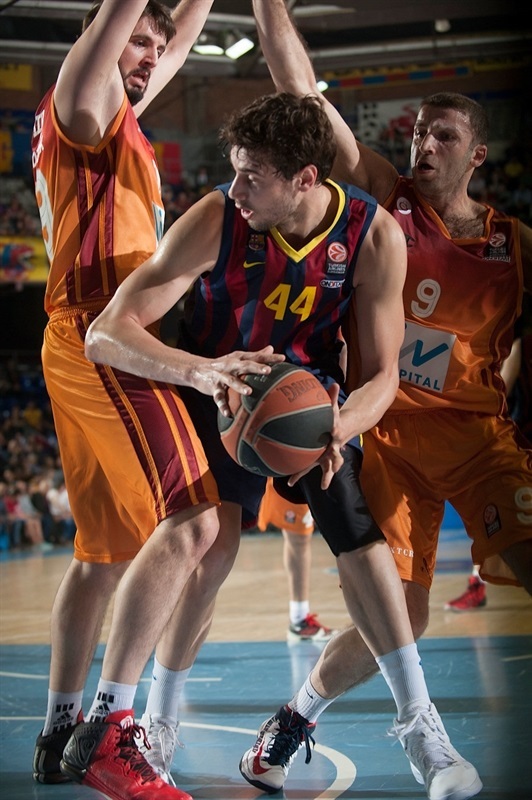 Macvan, Nachbar and Cenk Akyol - playing power forward in a small Galatasaray lineup - made foul shots before an inside basket by Tomic gave Barcelona its first double-digit lead, 56-46. Arslan and Oleson exchanged triples to fix the score at 59-49 after 30 minutes. Oleson buried a six-meter jumper from the right wing early in the fourth quarter which Tomic followed with a layup, breaking open the score at 63-49 with 9 minutes remaining. Galatasaray had troubles circulating the ball and a three-pointer by an unstoppable Oleson sent the crowd to its feet and the score to 66-49. Navarro made a technical free throws and Oleson struck again from downtown to seal the outcome, 70-49, after a 14-0 run. Erceg tried to change things with a turnaround jumper and Manuchar Markoishvili did even better with a triple, but Lorbek kept Barcelona way ahead, 72-54. Tomic found Abrines for a big slam, as Galatasaray gave playing time to Dudley and Pops Mensah-Bonsu, who also returned from injury tonight. Kostas Papanikolaou made free throws and by the time he hit a jumper, everything was said and done, as Barcelona had cruised to a well-deserved, convincing home win. "We are very happy with this first playoff win. What we said before the game was right: this is the third consecutive playoffs series in which we have had a slow start in Game 1. It took us a while to get into the game. We were a bit blocked in the opening minutes. We didn't play well on defense or offense. 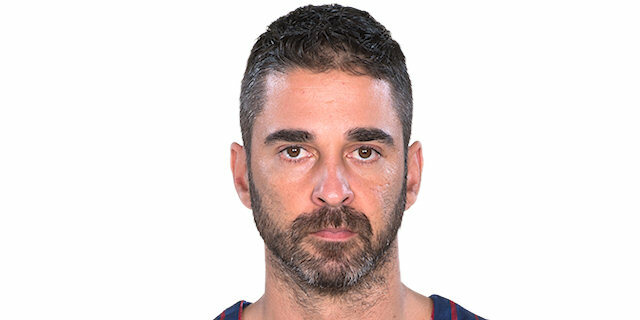 Juan Carlos Navarro was the only man who felt confident and into the game. Gradually, starting in the second quarter, other players stepped up. We were already playing well when Arroyo got injured. We finished well the first half: Jacob Pullen gave us energy. We have played in the second half at the level that allowed us to be first in our Top 16 group. We had 13 assists, shot better, shared the ball and our big man scored. Juan Carlos kept us in the game early and Jacob changed the game, giving our fans and his teammates confidence. We were ourselves in the second half. We needed to play well, feel good on court, shoot better, pass the ball better, play our game. Right now I don't know if Arroyo will play or not in Game 2. We will prepare the game thinking that he will play." "We played two different games. We put our strategy on court in the first half of the game, starting very well with our pick-and-roll offense. Arroyo had the ball and he is the leader of our offense. 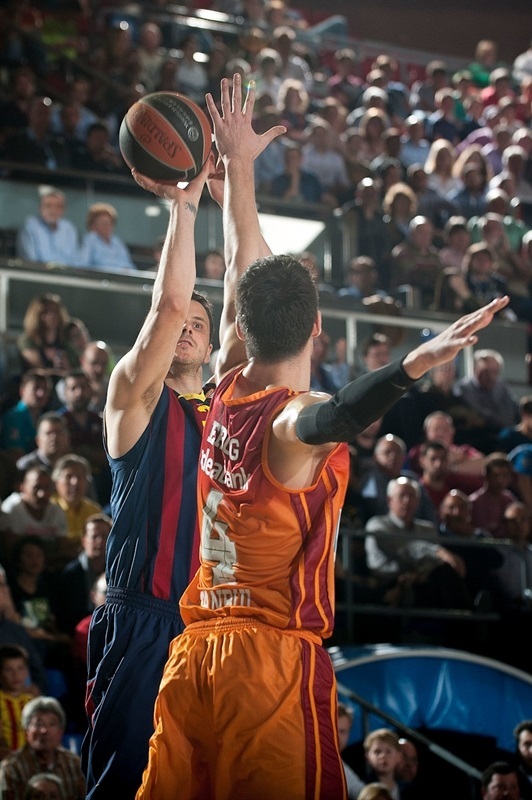 We succeeded in controlling Barcelona's offense, only allowing two three-point shots by Navarro. We took control of the game. Of course, we had a completely different second half for two reasons. First, we lost Arroyo in the last minute of the first half and he is a very important player for our offense. We know that if you want to win in this court, you need good defense to prevent them from running. Without Arroyo, we lost control on offense. The second thing wasoffensive rebounds, especially after missed free throws. It was a close game and we lost control, Barcelona played at its rhythm after that." "Exactly what we needed. At this time, we have to stay focused, stay on the path, stick to the rules that coach gives us each and every game on defense. It's a great team win tonight. We had 17 assists, we really passed the ball. And the big thing for us was defense. It was a shame that Arroyo went down for them, because he was really playing well for them. It mixed the game up when he went down because their team really couldn't play without him. We played really good in the second half." "The most important thing is that we are leading 1-0. We didn't have a good start and were nervous on offense and defense, but we counted on that. This is a game with a lot of added pressure. We are happy, but this is just a 1-0 lead in the series. We were ourselves in the second half, playing really well, sharing the ball and doing much better on defense. Not having Arroyo was big for them. I wish him luck and hope that he is ready to play in Game 2. I am happy because after these 15 minutes of nervousness, the team changed everything in the second half and found its identity. That's the key. 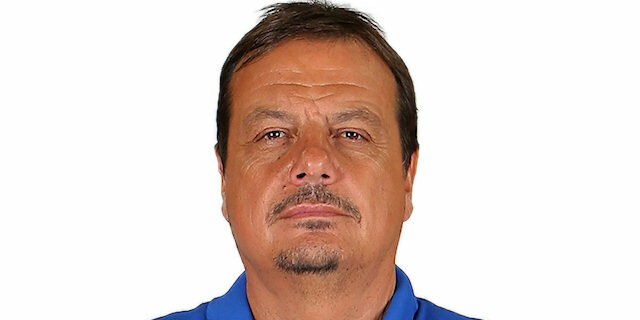 I am sure Galatasaray will have a different game plan on Thursday. If this team is in the playoffs it's because it has a deep roster." "It was very difficult at the start. Galatasaray started really well, in particular Arroyo. In the second half, we started playing better defense, and that improved our offense. But it's still 1-0. We have to be consistent now." "We started the game really well. In the first half, we played great, but after we lost Carlos Arroyo we started losing control of the game in the second half. 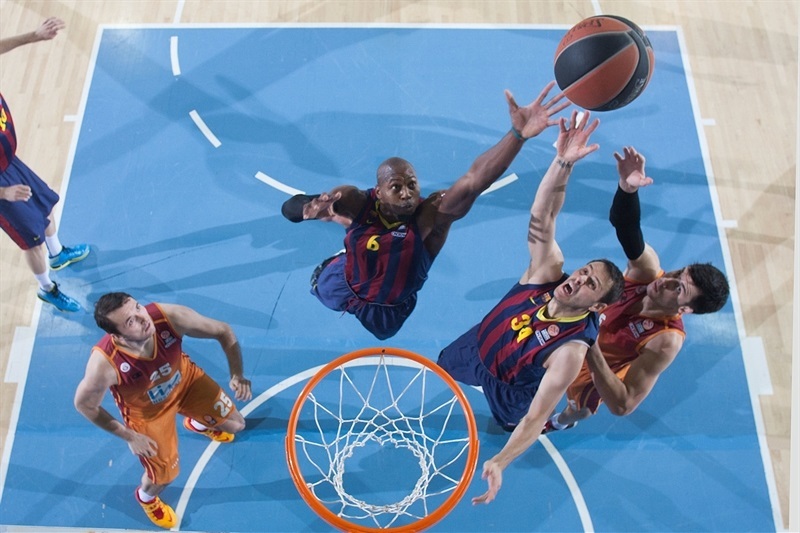 Barcelona increased their defensive level also, and shot with very good percentages. We lost the first game, but it does not matter by home many points we lost. The last quarter, we started thinking about the second game. It is not easy to play against Barca two games in three days, but we will try to do our best and we will try to play 40 minutes of the second game like we played in the first half tonight." "We have to be confident in our ability to win the next one. We are a team with the talent and experience necessary to have a successful series. I don't understand what happened in the second half. We have to understand again what we need to do on the court, which is play defense, perhaps be a bit selfish in certain situations, move the ball and find the open man. We just have to get back to believing in ourselves."